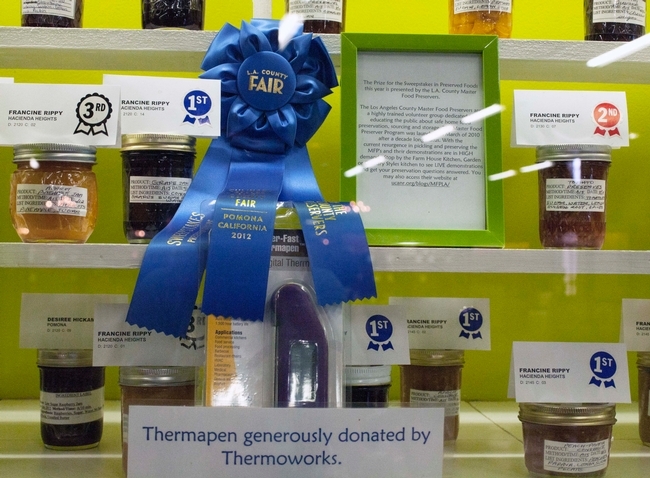 The Los Angeles County Fair closed yesterday for another year, but 2012 Blue Ribbon Sweepstakes Award winner Francine Rippy never takes a break from preserving food. 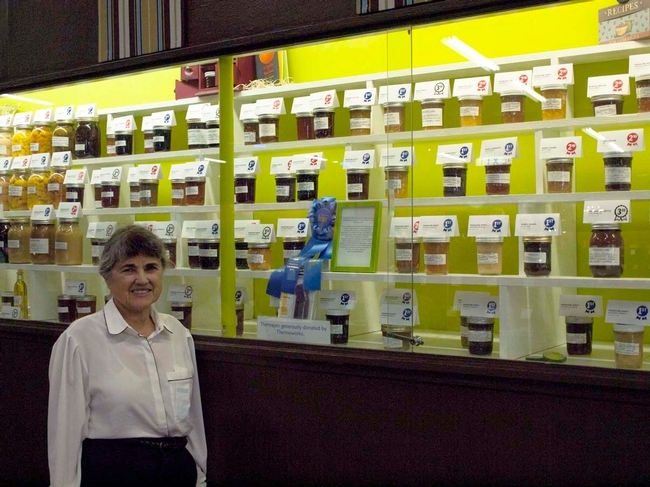 Francine had 73 entries in this year's Preserved Foods competition and won the most first place ribbons this year, which earned her the prestigious 2012 Blue Ribbon Sweepstakes Award. To honor her achievement, The Master Food Preservers of Los Angeles County presented Francine with a Thermapen thermometer, generously donated by Thermoworks. Francine started entering the LA County Fair Preserved Foods competition in 1965 and competed for 36 years before she won her first Sweepstakes Award. Francine joked, "I used to tell people I specialized in second place ribbons." But that trend is long past. Francine has won the Blue Ribbon Sweepstakes Award nine times since her first win in 2001 and has become a living legend within preserved food competition circles. During the short time I spent with Francine at the LA County Fair, a number of people stopped in their tracks when they realized that they had stumbled upon the elusive Francine Rippy. One woman said she'd always wanted to meet Francine because she'd been losing to her for years. Another woman interrupted our interview to offer Francine the fruit from her neighbor's fig tree. Francine accepted these compliments with grace and left with a new source for fresh figs. Entering the Preserved Foods Competition at the LA County Fair is only a small part of Francine's food preservation efforts. She preserves food year round, much of it coming from her four-acre property in Hacienda Heights. When asked about her favorite preserved food, Francine said that she likes the boysenberry leather best. Why? Because it's good. And she grows the boysenberries herself, just as her grandmother did. When Francine was a child, she followed her grandmother around in the boysenberry patch on the family ranch, eating the ripe boysenberries and putting the unripe ones in her basket. When picking berries in her own boysenberry patch, Francine encourages young visitors to do the same. "I tell them that's their job since that's what I did." Francine's grandparents' ranch has been turned into a museum-- The Hathaway Ranch & Oil Museum-- and Francine is the executive director. In this role, Francine helps to preserve a small piece of California's pioneer past, but she lives very much in the present. She's also always looking forward. I asked Francine if she had any advice for people hoping to enter the preserved foods competition at the LA County Fair next year. She smiled and said, "The judges have a sweet tooth."